Andalucia Homes: Like new! Light, bright, & refreshing home located only minutes to everything you need. 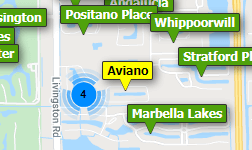 Less than 5 miles to Naples beach, Waterside Shops, Mercato Plaza, etc. Easy highway access makes a trip to the airport a breeze. Home has been designed w Z Gallerie light-fixtures/furniture. Upgrades include stainless steal appliances, plantation shutters throughout, air conditioned garage, new security system w cameras, etc. Perfect for a family looking to reside in a fine gated community in one of Naples highest rated school districts. Book a showing soon this property is sure not to last long. Andalucia Homes: Do not miss this opportunity, single story home of part time homeowners sits on a premium lot with long lake and fountain views has seen very little wear and tear, and has barely been lived in and shows like a model! The large open concept kitchen with counter height oversized island is upgraded with granite countertops, stainless steel appliances, under cabinet lighting, a walk in pantry and so much more! This home has it all including an extended lanai overlooking the beautiful lake and fountain, gutters and downspouts, a bidet, crown molding, coffered ceilings, plantation shutters in the guest bath, blinds throughout, motorized awning on the lanai for the best outdoor living has to offer! Andalucia is a gated community with a clubhouse, community pool and spa, exercise room, basketball court, playground and more! This community is centrally located in the heart of Naples near A+ rated schools, convenient to all shopping and of course the beautiful gulf of Mexico. This well cared for, barely 3 year old home is a must see! Schedule your showing today or join us at one of our weekly open houses! Andalucia Homes: This 2 BR plus optional, 3rd bedroom/office with den/dining room is nestled within the gorgeous and gated community of Andalucia. Boasting a wide range of updates to include the brand new A/C unit (2018) w/ 10 yr warranty and upgraded security locks, you can simply move in and relax. From the tray ceilings in the living room and master suite, to the crown molding and plantation shutters, luxurious touches flow throughout this beautiful home including sliders w/ custom cornices and Hunter-Douglas blinds. You’ll love entertaining friends in the open and tiled living area, overlooked by a bright and welcoming kitchen w/ Quartzite counters, breakfast bar, and ample storage. The dining nook in the kitchen is perfect for brunch, while an additional dining space is ideal for a more formal affair. All bedrooms are generously sized including the master, which features direct access to the pool, and a private ensuite w/ dual sinks, soaking tub and walk in shower. The sunny pool deck gives you a new pool motor (2018), a fanned patio, and a peaceful preserve view. A 2 car garage and laundry room complete the floorplan. You don't want to miss this opportunity, schedule your showing today! Need professional assistance selling your property at Andalucia Naples? Find out how an Area Specialist can help to generate more property exposure in order to get the most money for your investment in the least amount of time.